[PDF] Drucker on Leadership: New Lessons from the Father of Modern Management | Free eBooks Download - EBOOKEE! Description: Although Peter Drucker, â€œThe Father of Modern Management,â€ died in 2005, his timeless teachings are studied and practiced by forward-thinking managers worldwide. His lessons and wisdom on the topic of leadershipâ€”the central element of managementâ€”are in constant demand, yet he wrote little under that actual subject heading. In Drucker on Leadership, William A. Cohen explores Druckerâ€™s lost leadership lessonsâ€”why they are missing, what they are, why they are important, and how to apply them. 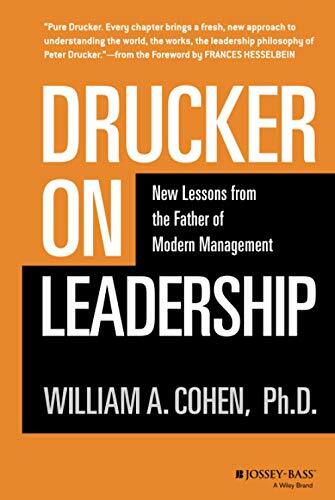 As Cohen explains, Drucker was ambivalent about leadership for much of his career, making it clear that leadership was not by itself â€œgood or desirable.â€ While Drucker struggled with the concept of leadership, he was well aware that it had a critical impact on the accomplishment of all projects and human endeavors. There is no book from Drucker specifically dedicated to leadership, but a wealth of information about leadership can be found scattered throughout his 40 books and hundreds of articles. Druckerâ€™s teachings about leadership have saved many corporations from failure and helped guide others to outstanding success. Many of the leadership concepts revealed in this book will surprise and perhaps shock Druckerâ€™s followers. For example, who would have thought that Peter Drucker taught that â€œleadership is a marketing jobâ€ or that â€œthe best leadership lessons for business or any nonprofit organization come from the militaryâ€? Written for anyone who values the insights of the man whose name is synonymous with excellence in management, Drucker on Leadership offers a deeper understanding of what makes an extraordinary leader. No comments for "[PDF] Drucker on Leadership: New Lessons from the Father of Modern Management".